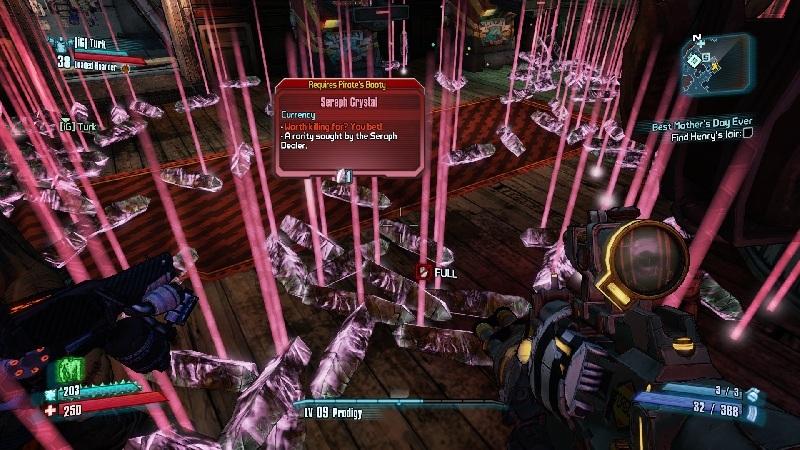 Mechromancer this week, new DLC expansion next week, that is the life of a Borderlands 2 Vault Hunter. As players sink into the new character Gearbox has announced what the DLC expansion is for next week, October 16th. Captain Scarlett and her Pirate’s Booty will have players traversing the slums of Oasis, a desert area similar to Tatooine from the Star Wars Universe in search for a wealth of new items, and a new currency (seen above) called Seraph Crystals. Players will also be able to use a new vehicle to traverse the hot sands. You can also expect a new head customization part for the original 4 classes and plenty of new raid bosses. The level of the content hasn’t been discussed and there is no talk of raising the level cap yet. Based on the pattern of the first game’s DLC I wouldn’t expect that cap raised till the 2nd pack. Pick this up next week for $9.99/800 points or get the Season Pass for $29.99 if you haven’t already.